One way to go...but which way? When I was a teenager the justification for one way streets was a hollow discussion, in my mind the need to turn around quickly, to change my mind, or simply have an “oops, missed the turn” moment, trumped all other arguments for them. My first awareness of “single minded streets” came as a seventh grader. The town in which I lived redirected north bound lanes of downtown traffic to the street my junior high school was located. From a sleepy, easy come, easy go existence, the school suddenly needed a NACAR pit stop just to drop off or pick up kids. The normal maturing of any town seems to include turning busy streets to one way thoroughfares. I recall on one date being particularly embarrassed that I’d missed the restaurant parking lot, not once, but twice while my town ‘matured’ around me. She was wholly and completely unimpressed. Alas, it was a short-lived relationship despite my best efforts, perhaps the one way streets should have provided my first clue. Relationships, like streets, can be one or two way affairs. We can choose to take the two way paths through town, with all of it’s opportunities to turn around, or commit fully to the one way street with its certain finish line on the other side. My first marriage was marked by a two-way street approach. Whenever I thought wrong turns had been made I attempted to ‘right’ the ship by quick u-turns. When I reflect on that time in my life I discover it littered with “circular exercises” attempting to find my way. The best advice I can give regarding relationships is to choose the one way path, and carefully watch the signs along the way. I made mistakes along the route, this is no secret, and with each missed opportunity I learned to watch the road I was on with more care. If you choose the two way approach of going back when challenges arise in your relationship you will find you are covering territory you should have left behind for good. Take a picture the first time, it’s easier, and really bad photos can be deleted. I am recently remarried, my wife is from Canada and thus must apply for a permanent VISA to move to the States. I could not have married with the burden of separation in past years (i.e. government borders). Governments do not understand u-turns in these matters. More than any other time in my life I recognize and appreciate the changes that are coming for my wife, she has fully committed. For her, it’s a one way decision without regret. 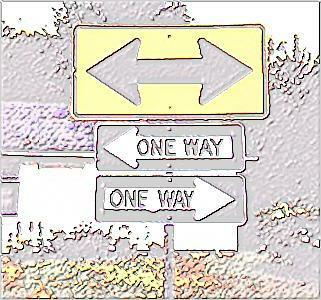 I conclude, all successful relationships will certainly recount passing the ‘One Way’ sign and deciding to fully commit, while the failed ones went the route of easy turn arounds. Tags: one way to go, this way or that, Tim Hief, which way should I go? This entry was posted on Saturday, May 24th, 2008 at 11:04 am by Tim Hief and is filed under Authors, Blogroll, Relationship Lessons. You can follow any responses to this entry through the RSS 2.0 feed. Both comments and pings are currently closed.